Those 'Hygienic' Toilet Seats At O'Hare May Not Be So Clean : The Two-Way The Chicago Sun-Times went inside the stalls and found that plastic wrappers designed to automatically cover toilet seats were not keeping things spick-and-span. Don't sit down before you hear this news. 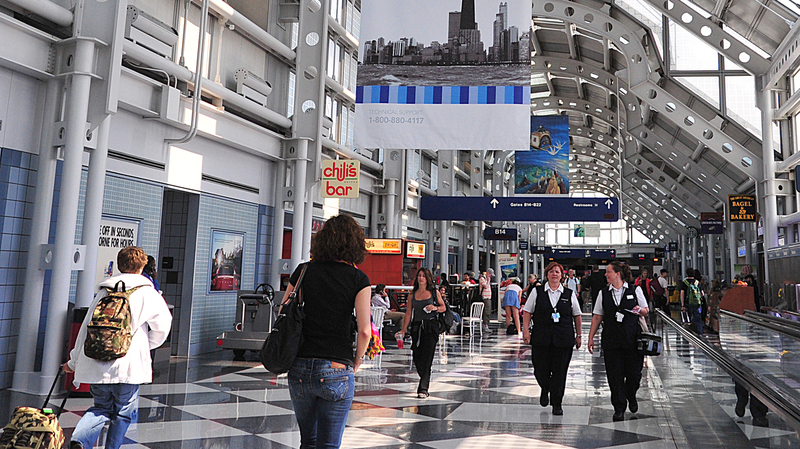 A concourse at Chicago's O'Hare International Airport. "Motorized 'hygienic seats' that a controversial new janitorial contractor installed recently at O'Hare Airport are not very hygienic after all," the Chicago Sun-Times reports. Designed to automatically cover the seats with a fresh plastic wrap after each use, the gizmo "drags up liquid from the rim of toilet bowls and leaves drops of that liquid atop seats, on the clear plastic film," according to the newspaper. It has video here. The contractor, according to Crain's Chicago Business, has been controversial because United Maintenance Co. did not tell authorities that it had sold a large stake of itself to another firm before winning the city business. Crain's, which has said the nearly $100 million contract now needs to be investigated, says " city law would appear to clearly require that bidders fully disclose their ownership to the city, so that aldermen and the public know who's getting what."